Put your confidence in a service in Falconwood with a customer happiness rating of over 96%! Q: What does the window cleaning in Falconwood include? usual internal window cleaning with ladders and squeegees. A: Our service will be conducted by skilled and fully vetted Falconwood window cleaners. They'll also don branded uniforms, so you'll easily notice them as soon as they arrive at your building. A: Essentially, this is a lengthy rod that blasts water under powerful water pressure. It allows the cleaners to reach the fourth storey of any business or residential building from the safety of the ground. Q: Will you your cleaning tool to my property's water source? A: Not at all! The specialists will use a special de-mineralised water storage inside their caravan. However, if the tank is empty, we will happily welcome your offer. Q: Are there any prerequisites that I should meet beforehand? A: You must make sure that there will be a free parking slot within 30 metres from your domain and on the same side of your casements. The experts also need to have an effortless access to your property. With our window cleaning in Falconwood, you get a meticulous wash of your sash windows, skylights, conservatory roofs, French doors, and other glass surfaces at modest prices. We will even provide you with a complimentary treatment of all PVC & UPVC window elements! For a detailed list of our prices, please view our price table below. Based on your needs, our window cleaning Falconwood can supply you with three choices. If you choose external cleaning, the specialists will utilize a special water-fed pole. This equipment can extend up to 22 metres in length, which is equivalent to the height of a four-storey building. The Falconwood window cleaners will use purified water under high pressure that will wash away all streaks in almost an instant. If you run a high-rise property instead, then have a loot at our rope access window cleaning. There, a team of licensed climbers will methodically shine your windows until they witness the image of the setting sun. For your comfort, we check the washing equipment on a frequent basis and can send COSHH reports at your request. For interior cleaning, the specialists will carry ladders and sponges to ensure that even the highest places will benefit from proper treatment. 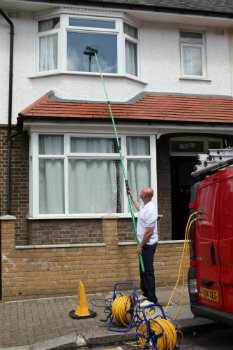 As our customer base expanded, we widened our window cleaning in Falconwood to cover other London areas as well. Please refer to our handy list to see which adjacent locations we visit. Another quick and easy way to get a free instant quote or to book window cleaning services Falconwood SE9 is through our web site.